Download "Emerging Markets Equity Rules of the investment basket, valid as of 2 May 2013"
2 within 12 months and the domicile of the credit institution is within the European Economic Area or in an OECD member state. A maximum of 20% of s assets may be invested in deposits accepted by the same credit institution. 5) Units of investment funds or units of collective investment undertakings that have received authorisation in Finland or another state belonging to the European Economic Area and which meet the requirements of the Directive on Undertakings for Collective Investment in Transferable Securities (EU) based on the legislation of their country of domicile and which can, according to their rules or articles of association, invest a maximum of 10% of their assets in the units of other investment funds or collective investment undertakings.. 6) Securities and money market instruments other than those specified in sections 1, 3 and 5 and at most 10% of s assets. No more than 10% of s assets may be invested in securities issued by the same issuer. 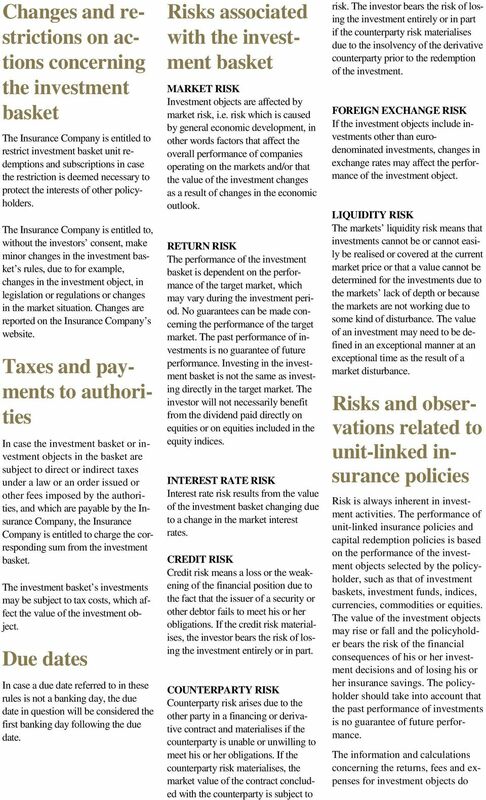 The total counterparty risk for the same issuer s securities, the deposits accepted by the corporation in question and such non-standardised derivative contracts that cause a counterparty risk concerning the corporation in question may not exceed 20% of s assets. Investment s investments into the same issuer s securities those value exceeds 5% of the assets cannot exceed 40% of s assets. 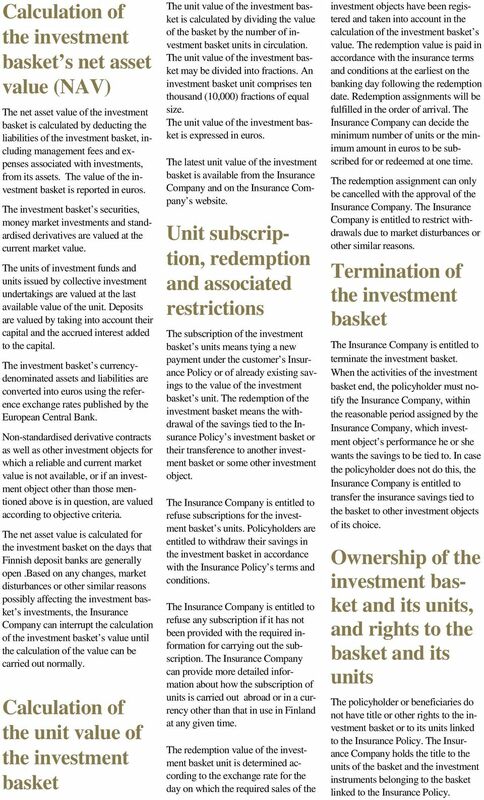 This limitation does not apply to deposits, to the units of fund investment companies or UCITS nor to investing in such non-standardised derivative contracts in which the counterparty is a credit institution as specified in section 4. Regardless of other investments, assets of can be used to buy or sell derivatives up to 100% of the total investment s risk, calculated in a situation where all of s assets have been invested in the securities markets. The risk position of derivative contracts is monitored daily using the collateral requirement and the delta ratio of. The security collateral requirement of the derivative contracts may not exceed 30% of the value of. No more than 25% of the value of the securities investments in may be given as securities loans, provided that they are settled in a clearing house or in a corresponding foreign corporation as specified by law. If the transaction is settled elsewhere, the counterparty to the agreement must be a securities broker as provided by law and the agreement terms and conditions must be typical of the market and generally known. The restriction does not apply to lending agreements that can be terminated and that refer to securities that can be immediately recovered upon demand. may take out a loan for activities for a temporary purpose, in an amount equalling no more than 10% of s assets. can depart from restrictions during a maximum period of six months from the commencement of activities. 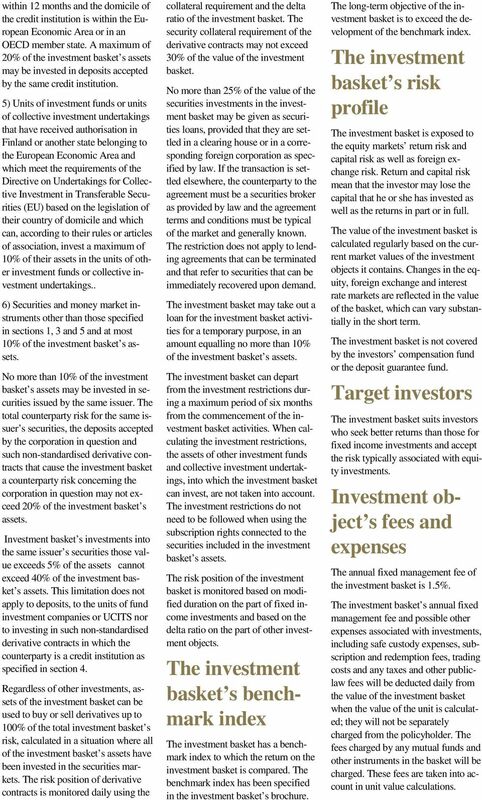 When calculating restrictions, the assets of other investment funds and collective investment undertakings, into which can invest, are not taken into account. restrictions do not need to be followed when using the subscription rights connected to the securities included in s assets. The risk position of is monitored based on modified duration on the part of fixed income investments and based on the delta ratio on the part of other investment objects. s benchmark index has a benchmark index to which the return on the investment is compared. 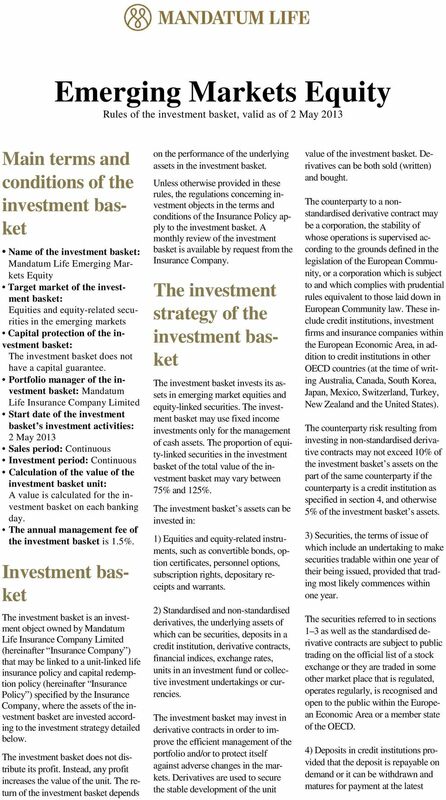 The benchmark index has been specified in s brochure. The long-term objective of is to exceed the development of the benchmark index. s risk profile is exposed to the equity markets return risk and capital risk as well as foreign exchange risk. Return and capital risk mean that the investor may lose the capital that he or she has invested as well as the returns in part or in full. The value of is calculated regularly based on the current market values of objects it contains. Changes in the equity, foreign exchange and interest rate markets are reflected in the value of the, which can vary substantially in the short term. 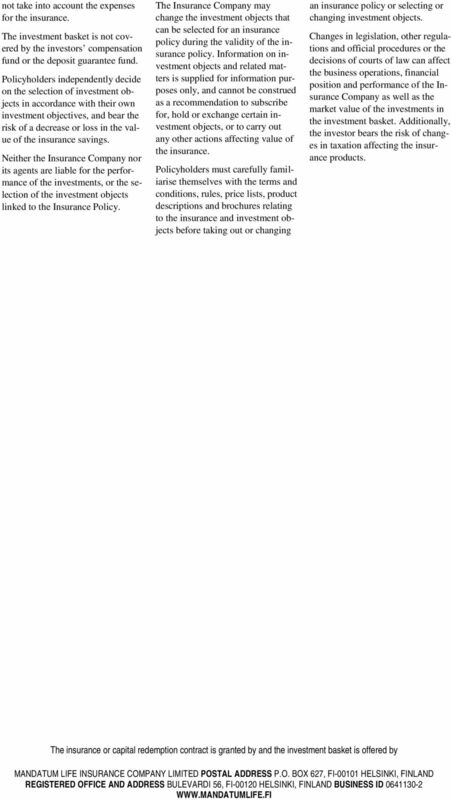 is not covered by the investors compensation fund or the deposit guarantee fund. Target investors suits investors who seek better returns than those for fixed income investments and accept the risk typically associated with equity investments. Investment object s fees and expenses The annual fixed management fee of is 1.5%. s annual fixed management fee and possible other expenses associated with investments, including safe custody expenses, subscription and redemption fees, trading costs and any taxes and other publiclaw fees will be deducted daily from the value of when the value of the unit is calculated; they will not be separately charged from the policyholder. The fees charged by any mutual funds and other instruments in the will be charged. These fees are taken into account in unit value calculations. 3 Calculation of s net asset value (NAV) The net asset value of is calculated by deducting the liabilities of, including management fees and expenses associated with investments, from its assets. The value of is reported in euros. s securities, money market investments and standardised derivatives are valued at the current market value. The units of investment funds and units issued by collective investment undertakings are valued at the last available value of the unit. Deposits are valued by taking into account their capital and the accrued interest added to the capital. s currencydenominated assets and liabilities are converted into euros using the reference exchange rates published by the European Central Bank. Non-standardised derivative contracts as well as other investment objects for which a reliable and current market value is not available, or if an investment object other than those mentioned above is in question, are valued according to objective criteria. The net asset value is calculated for on the days that Finnish deposit banks are generally open.based on any changes, market disturbances or other similar reasons possibly affecting s investments, the Insurance Company can interrupt the calculation of s value until the calculation of the value can be carried out normally. Calculation of the unit value of The unit value of is calculated by dividing the value of the by the number of investment units in circulation. The unit value of may be divided into fractions. An investment unit comprises ten thousand (10,000) fractions of equal size. The unit value of is expressed in euros. The latest unit value of is available from the Insurance Company and on the Insurance Company s website. Unit subscription, redemption and associated restrictions The subscription of s units means tying a new payment under the customer s Insurance Policy or of already existing savings to the value of s unit. The redemption of the investment means the withdrawal of the savings tied to the Insurance Policy s investment or their transference to another investment or some other investment object. refuse subscriptions for s units. Policyholders are entitled to withdraw their savings in in accordance with the Insurance Policy s terms and conditions. refuse any subscription if it has not been provided with the required information for carrying out the subscription. The Insurance Company can provide more detailed information about how the subscription of units is carried out abroad or in a currency other than that in use in Finland at any given time. The redemption value of unit is determined according to the exchange rate for the day on which the required sales of the investment objects have been registered and taken into account in the calculation of s value. The redemption value is paid in accordance with the insurance terms and conditions at the earliest on the banking day following the redemption date. Redemption assignments will be fulfilled in the order of arrival. The Insurance Company can decide the minimum number of units or the minimum amount in euros to be subscribed for or redeemed at one time. The redemption assignment can only be cancelled with the approval of the Insurance Company. The Insurance Company is entitled to restrict withdrawals due to market disturbances or other similar reasons. Termination of terminate. When the activities of end, the policyholder must notify the Insurance Company, within the reasonable period assigned by the Insurance Company, which investment object s performance he or she wants the savings to be tied to. In case the policyholder does not do this, the Insurance Company is entitled to transfer the insurance savings tied to the to other investment objects of its choice. Ownership of the investment and its units, and rights to the and its units The policyholder or beneficiaries do not have title or other rights to or to its units linked to the Insurance Policy. The Insurance Company holds the title to the units of the and instruments belonging to the linked to the Insurance Policy. Danske Invest Government Bond Fund Bond Funds Fund Regulations The Finnish Financial Supervision Authority approved the Regulations on 18 October, 2012. These Regulations are valid as of 19 December, 2012. All times mentioned are Finnish time, and all banking days mentioned are Finnish banking days. the disposal of the account holder or authorised user, excluding, however, transactions related to the crediting of deposit interest. The net asset value (NAV) is owned by the fund shareholders jointly. Each fund unit entitles the holder to an equal share in the assets of the fund. CYGNUS UCITS FUNDS SUPPLEMENT CYGNUS VALUE FUND. Cygnus Asset Management SGIIC S.A. The Global Bond (Euro Hedged) Fund to provide income and capital growth. Instructions for the quarterly reporting of AP funds, excluding the 7th AP fund. 2. How can I benefit from Shariah Compliant Unit Trust Funds? FAQ Shariah Compliant Unit Trust Funds 1. What are Shariah Compliant Unit Trust Funds? Shariah Compliant Unit Trust Funds (or Shariah Compliant Mutual Funds) are medium to long-term investment products.